If you’ve ever been to London, you have seen CBS Outdoor (CBSO) media formats. No exceptions. 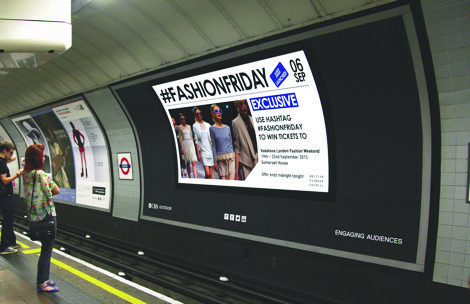 Their media assets dominate London, with London Underground and Bus advertising formats offering ubiquitous coverage of the capital. More recent additions to the CBSO estate include Westfield (East and West), which neatly bookend their London offering. Tim Cartwright has the huge task of leading the digital sales strategy and working with agencies and clients to get the best out of digital. CBSO’s digital inventory is sold as part of their wider estate BUT it is Cartwright’s team that focuses solely on digital. “We supply the collateral and the expertise in the digital area to support the wider sales function”, says Cartwright. Working with clients to get the most out of their digital formats, Cartwright is also tasked with identifying new routes to market and guiding future strategy based on wider trends and demand from advertisers. 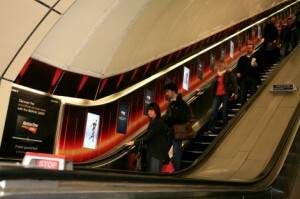 Most of CBSO’s best-known digital formats can be found on London Underground. With Digital Escalator Panels (DEPs) across 20 escalator runs, 253 portrait LCDs and 126 Cross Track Projection (XTP) screens (shown above), their digital offering has some serious scale as well. Managing a digital estate of this size brings large operational challenges for any media owner, but for CBSO the challenges are bigger than most. It’s one thing installing digital screens into modern and connected environments, such as shopping malls or airports, but the London Underground throws up enormous engineering and infrastructure challenges; hundreds of stations with varying architecture, buried deep underground, with only a limited amount of time to access the screens during the night. As a result, CBSO have one of the largest ‘back-room’ operational departments in the industry, with engineering, maintenance and scheduling teams all doing much of the unseen work that keeps the network ticking along. The roll out of XTP was one of the biggest engineering challenges they’ve faced. The large, heavy units had to be safely lowered on to train platforms and installed during nighttime engineering hours. It was an immense task. But despite overcoming these challenges and successfully rolling out the XTP network in 2008, the format had its critics from Day 1 and struggled to win the hearts of the media buying community. This led CBSO to re-think the format and use it instead as a content platform. “Our concept was to turn it (XTP) into a content channel, rather than a pure advertising platform”. For Cartwright, the proposition has always had its strengths, “it delivers an audience of 1.4m standing 3 metres from a full motion digital screen, across a number of iconic locations”, but it was now time to really engage with its audience in a new way. Using their own audience insight tool – work.shop.play. – CBSO was able to start hosting content that matched the mood and mindset of their audience throughout the week. Underground users can now see live content from Time Out, which aims to inspire the audience with Theatre and Restaurant reviews. On a dreary Monday morning you can expect a healthy dose of escapism and holiday ideas from Lonely Planet, with a neat feature that tells commuters how many hours it would take to fly to each destination. The recently launched content piece – Commuter Kitchen – shows the true extent of CBSO’s ambition to invest heavily in engaging content. Hosted by chef, Lisa Faulkner, over 30 different edits were produced, each showing commuters how to prepare a range of different dishes. Extended content and recipe instructions were also hosted on CBSO’s website. It generated a huge response, and even provoked a few of the more quirky responses from the general public, with one person even criticizing it for promoting obesity and gluttony! “For us [these kind of comments] are great as it proves the content is engaging!” states Cartwright. This change of approach on XTP also has commercial benefits. CBSO can appeal to non-OOH agency departments, such as AV or sponsorship teams. Brands can also align against specific content to improve the relevance of their campaigns. And this could all be a very timely change, with the next generation of XTP screens due to be rolled out in the near future. But it is still DEPs that remain the most famous and popular DOOH format for CBSO. “DEPs were a game changer, not only for us, but for the whole OOH market”, says Cartwright, also recognizing that DEPs have become a special part of the Underground experience. “It’s the format the everyone remembers, has an affinity to and is passionate about.” Indeed, many of us will remember the powerful campaign for Shelter, which showed children knocking at the screen, to raise awareness for poor housing conditions that many children face. DEPs contain all the ingredients of a successful DOOH format: dwell time, close proximity to the screens and a powerful digital canvass. But it was the opportunity to run sequential creative on the screens that really excited creative agencies and advertisers the most. Campaigns such as Orangina and Sony Bravia provide great examples of this. CBSO have long worked with creative agencies to help deliver sequential campaigns, and to bring to life the full capabilities of the format. DEPs are now a ‘must-have’ for many major advertisers and it’s where you are likely to see many of the most striking creative executions. Advertisers are still creating bespoke content purely for DEPs. Tanqueray Gin was one such example. Content was filmed specifically for DEPs and showed commuters how to make four different cocktails. Each step of the cocktail making process was shown on separate screens, to stunning effect. Cartwright still believes that, on the whole, the OOH industry is only at the tip of the iceberg when it comes to content. “We’re at the early stages of content in OOH.” Media owners have to work hard to force the content agenda and to be flexible enough to behave in non-OOH ways. CBSO Express is a good example of this. It’s an initiative that allows advertisers to supply Press copy and have it animated and up across the CBSO network within 8 hours. For Cartwright, OOH has the power to amplify other media, such as Press or TV. Digital OOH opens up new ways of doing this, with its fast turnaround times and day part capabilities. Scale is key too, and with CBSO’s portrait LCD screens now commonly available in most of their environments, they have a uniform product that can easily reach large audiences at the touch of a button. As for CBSO’s future, they will soon be rolling out the next generation of XTP screens. Cartwright and the team are also looking at other development opportunities in some detail; “don’t be surprised to see Buses digitized at some point”, says Cartwright. Expect more on this in the future. It will be a huge challenge to create the right solution for Bus, but CBSO clearly have the pedigree to deliver it, especially given their track record in rolling out screens in difficult environments. And there’s the small matter of a new name. As of 2014, CBSO will become Exterion Media. As the DOOH industry enters into a steep curve of development, expect Exterion media to be a name that is synonymous with many of its future innovations and achievements! This entry was posted on Friday, December 6th, 2013 at 10:10 @465 and is filed under The Hub. You can follow any responses to this entry through the RSS 2.0 feed. You can leave a response, or trackback from your own site.